Nvidia is preparing a new, massive building in Santa Clara, CA and this is it. Called Voyager, it will be larger than the building Nvidia just finished constructing by 250,000 square feet. And just like the other building, Endeavor, Voyager will share the same wild, distinctly Nvidia design. Nvidia opened the first building, Endeavor, in 2017 and it feels like if a person could go into an Nvidia GPU. There’s green and sharp angles everywhere. Triangle skylights pepper the roof, which is also a triangle. It’s just two stories due to local zoning laws and it appears the new building will following much of the same trends. 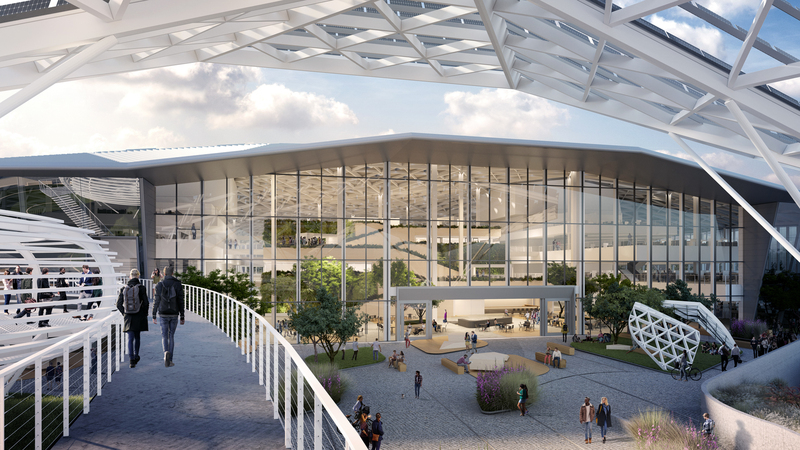 Voyager will be 750,000 square feet and situated next to the Endeavor in Santa Clara. This puts the combined buildings’ square-footage at 1.25 million, which is a little less than half of Apple’s new HQ in Cupertino. Nvidia tells me the company is still planning the building’s staffing but expects the building will house its growing engineer teams. The company has 11,500 employees around the world with 5,000 in Santa Clara. Nvidia is using Gensler to design the building and it will be constructed by Devcon, the same companies tapped for the first building. Construction is expected to start next month and take up to three and a half years. I asked Nvidia why these buildings are named after notable spacecraft. The response is interesting. Endeavor and Voyager have the initial sounds of “En” and “V”, hence the initial sounds of Nvidia, while the names also suggest a sense of pushing frontiers. Cheesy? A bit, but still clever and I’ll buy it.